At colleges across the country there are cash-strapped students who are hungry and undernourished. Although there are no firm figures about the number of UCLA students who struggle with food security, Savannah Gardner knows they’re here. She knows because she’s one of them. 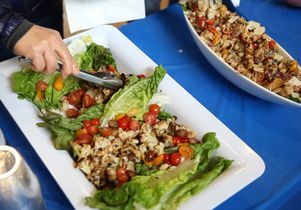 “The reality is that there are students who are struggling not just to pay tuition and manage other financial obligations, but also to afford enough food — and foods that are healthy,” said Gardner, a sophomore who is majoring in environmental science and political science and minoring in civic engagement. Rebecca Bork (middle) and her children, Ava and Finn, are among those who benefit from having fresh produce delivered by UCLA students to the UCLA University Village. Gardner said current estimates from existing surveys show that roughly 20 percent of UCLA students experience food insecurity. First-generation college students and those from low-socioeconomic backgrounds are among the hardest hit when it comes to not having enough to eat each day, she said. With this in mind, she and UCLA Ph.D. student Tyler Watson are leading a multipronged project to alleviate campus hunger and food waste. Along with six other Bruins, they are among 44 UC students selected to lead projects at their respective campuses as part of the UC Global Food Initiative Fellowship program. 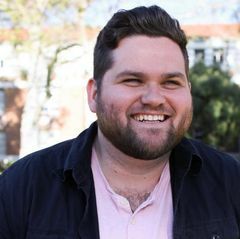 “This fellowship represents an opportunity to really make a tangible impact on students who live, work and study at UCLA,” said Watson, UCLA’s Global Food Initiative student ambassador who, as part of his graduate work, is studying food security in urban populations and local food production as a solution to food security. 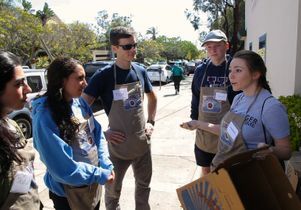 Every Sunday, Gardner and Watson lead a group of UCLA students who volunteer with Food Forward, a local nonprofit that supplies more than 6 million pounds of food annually to nearly 1 million people in Los Angeles and five neighboring counties. The students head for farmers markets in Pacific Palisades or Brentwood. There, they collect 500-600 pounds of fruits and vegetables donated by local farmers for distribution to organizations and families in need. Half of this bounty makes its way to the UCLA Food Closet in the Student Activities Center and the 580 Café at St. Alban’s Episcopal Church, both of which serve financially insecure students; some of the food is distributed to graduate students and their families living at UCLA University Village. The other half goes to Food Forward. On a recent Sunday afternoon, Rebecca Bork and her two children — Ava, 9, and baby Finn, 3½ months — were the first in line at the University Village apartments to pick out produce gathered by student volunteers. “Oh, look, they have Brussel sprouts,” said Ava, excitedly. Bork, whose husband is a graduate student at UCLA, said she and her neighbors appreciate having access to such high-quality produce. 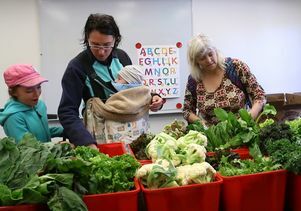 “It’s fun to see what’s available each week,” she said, adding that it’s often hard to get out to the farmers market on her own with the kids. Children living at University Village love picking out produce, Bork said. Some of them come on their own to pick out items for their entire family, gaining a sense of independence and parental trust. 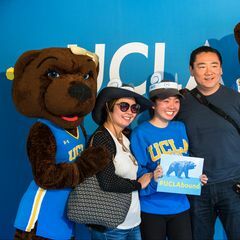 In addition to supplying fresh produce to students and their dependents, and to the broader L.A. community through Food Forward, Gardner and Watson are developing a mobile app to notify students in real time of the availability of excess food from campus events. They are also leading a campuswide campaign to raise awareness about the issue of student hunger, conducting focus groups to learn more about the issue and facilitating cooking classes that feature fresh, nutritious ingredients. The first class, held in the fall quarter at 580 Café, was led by former White House pastry chef Bill Yosses, who has visited campus several times over the past year as a guest of the UCLA Healthy Campus Initiative, a campuswide effort, envisioned and supported by philanthropists Jane and Terry Semel, that emphasizes the health and wellness of students, staff and faculty. 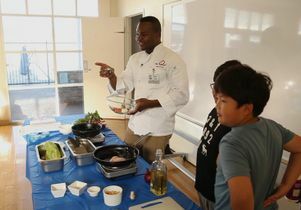 First-year UCLA medical student Marquell Craddock leads a cooking demonstration using produce gleaned from the Pacific Palisades Farmers Market. A second class, led by first-year UCLA medical student Marquell Craddock, was held in March at University Village. “I like to make vegetables the main dish,” Craddock said. “I think that’s something that’s truly important.” Using many of the fresh whole foods delivered by Gardner and Watson, Craddock demonstrated in class how to make a simple fruit bash finished with lemon juice and mint; roasted sweet and spicy cauliflower; and a chickpea salad with honey mustard vinaigrette and shaved parmesan. Craddock advised attendees to never buy more than they need. He and his wife generally know what food items they have in their kitchen at all times, he said, and they like to be creative in the kitchen. For Gardner, this work is not only beneficial to her peers, it also has personal meaning. Gardner, who volunteers for the campus chapter of Swipe Out Hunger and was enrolled in UCLA’s inaugural Food Studies and Food Justice class, has also volunteered with anti-poverty organizations in Los Angeles, New York and Washington, D.C. She was raised by a single mother of five who fed her family on one income and enrolled in college when Gardner was in elementary school. She said the GFI fellowship and food justice class have helped her better understand her own history with food insecurity. It has also helped her feel more confident and less embarrassed about sharing her own experiences of going hungry.